After three years, it is here! 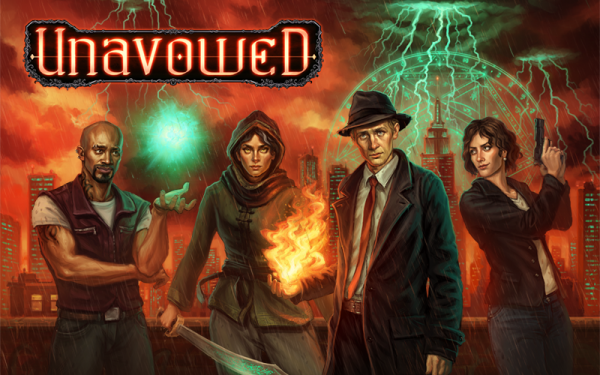 Unavowed is now available to buy and play on PC and Mac. You can buy it directly from us, or Steam or GOG if you prefer using them. As always, thank you to everybody! We hope you enjoy the game. Unavowed is coming August 8th! After three years of production, we finally have a launch date. Unavowed is hitting the virtual shelves on August 8th, 2018. Unavowed has a teaser trailer! Technobabylon is now available on iPhone and iPad! Tiny Technobabylon is now available for $4.99 on the App Store! Y’all know how this works by now. These games live and breathe by word of mouth, so please leave a review/comment on the App Store! -Dave, Janet, James et all. Shardlight is now available on iPhone and iPad! Palm-sized Shardlight is available for $4.99 on the App Store! As always, please leave a review if you enjoyed the game! Games like this live and breathe by word-of-mouth, so if you have time we’d appreciate it.